In the heart of the Frank Church-River of No Return Wilderness in central Idaho, the Thunder Mountain region was a gold mining hot spot in the late 1800s-the last major gold rush in the lower 48 states. 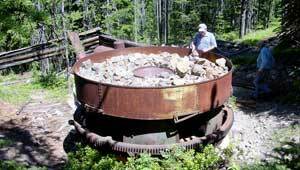 Today, the area is popular with people who come to fish, hunt, hike, ski, and snowmobile, or explore historical mining structures and workings that date back to as early as 1866. Though mineral exploration and development stopped long ago, hundreds of mining claims are still privately owned in the area, and modern extraction techniques have raised the potential for industrial-scale development, causing irrevocable harm to the landscape and its resources. Working with the landowners and the U.S. Forest Service, TPL protected more than 720 acres at Thunder Mountain, protecting the heart of the Frank Church-River of No Return Wilderness.